India’s largest integrated organic farm-the Hathikuli Tea Estate is situated in the periphery of the Kaziranga National Park. Instead of chemical fertilizers, we use vermi-compost and instead of dangerous pesticides we let nature create its own predators of pests. The fragile ecosystem is well preserved by our Organic Farming – where every care is taken to protect Nature. Hathikuli Tea Estate has the distinction of producing Premium Black CTC, Orthodox and Green Teas. Excellent quality of Organic Black Pepper is also produced within the certified organic Plantation. Organic Tea produced in the estate provides not only a fuller and richer taste, but also satisfies the consumers need for a healthy choice for tea,which is in sync with the ever increasing health consciousness of consumers worldwide. It has a gentle haunting aroma which immediately envelops the senses and provides a lasting finish. To experience the freshest and best quality organic tea, try our wide range of offerings from the Hathikuli Tea Estate. 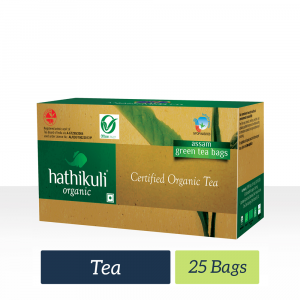 Each cup brewed with Hathikuli Organic CTC tea bag provides a refreshing experience for the consumer. Each cup brewed with Hathikuli Organic green tea bag contains all the goodness of green tea and provides a refreshing experience for the consumer. A product under the Hathikuli Organic brand, this tea is sourced from a single estate Hathikuli , present on the periphery of Kaziranga National Park in Assam. Hathikuli, which means “frequented by elephants” in Assamese, ensures a light and aromatic flavor that is invigorating and refreshing.